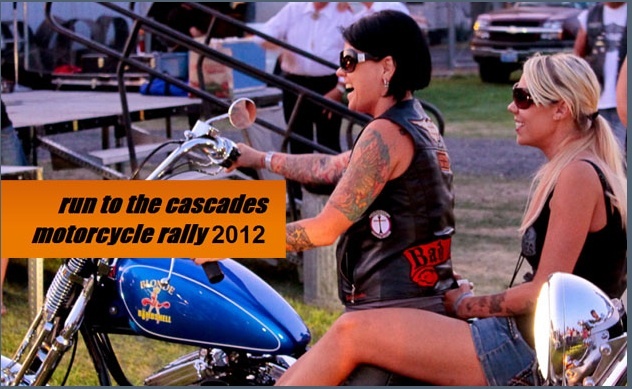 In 2011 it was Prineville’s first experience in hosting the Run To The Cascades motorcycle rally. According to Aaron Myhra/Fonzie Productions Inc. (Event Promoter), who acquired the rights to the event, it was a success and positive for the community. The rally was resurrected after being absent for 10 years. However, there were a few reports about an overbearing amount of law enforcement, and complaints of live music being cancelled. Go HERE for more information. Now let’s jump ahead to last weekend. The Run To The Cascades was in Redmond, OR at the Deschutes County Fairground and as I previously posted HERE the event was shut down by the police following a confrontation between biker groups (Mongols and HAMC). It is with a heavy heart that we are making this public statement today. Our greatest priority when putting on Run To The Cascades (RTTC) is always the safety & enjoyment of the public. This is why we moved RTTC to the Deschutes County fairgrounds, made gate admission more affordable, and brought in amazing vendors & entertainment. This event is a 9/11 memorial/freedom celebration. This event is an opportunity for us to all gather in our community, young and old, to honor the lives lost on 9/11. RTTC is an event created to honor the men & women that have, and those who currently, serve our country—including their families at home—in order that we may gather freely, without fear of condemnation or discrimination. The irony is, we did gather for this purpose, and Saturday morning following the 9/11 memorial parade through downtown Redmond, we met back at the fairgrounds for a freedom celebration. After the parade, there was a Color Guard Presentation of our National and State flags by respected Native American veterans from Warm Springs. A greeting from Redmond mayor George Endicott, a Vietnam veteran, followed the Flag Ceremony. Mayor Endicott welcomed us all to the city, and even went on to say that he had asked his PD to give some tolerance and understanding. We, the staff & volunteers of The Run to the Cascades Motorcycle Rally, are appalled at the abrupt closing of our event because of a “potential” threat of violence. Contrary to reports, there were NO conversations by law enforcement officials, or even an attempt made by law enforcement to have conversations with either party, who were allegedly involved in a 30 minute “verbal tussle” that handled itself, with both parties involved exiting the fairgrounds without incident. Law enforcement abruptly shut down the event HOURS AFTER both parties had peacefully exited the event, telling ALL participants, via the PA system, to exit the fairgrounds IMMEDIATELY. Law enforcement stood by and watched as thousands of people driving trucks, motor homes, cars, and motorcycles tried to exit out of the one gate law enforcement had left unlocked. This occurred as thousands of confused people were trying to make their way into the fairgrounds for the evening showing of the Knights of Mayhem and the Foghat concert. Had it not been for the brave and quick response of our staff & volunteers, who had very limited information as to why we were shutting down—literally stepping in front of moving vehicles and directing the chaos—people could have been seriously injured or worse. Vendors, campers, and attendees with no plan of leaving until later in the evening, or at the event’s conclusion Sunday morning—following the bike blessing and church services—were forced out of the fairgrounds, some of whom had been legally drinking. This action, on the part of law enforcement, put event-goers & many other innocent people in our community into harm’s way. We have since received reports that several DUI’s were issued in Deschutes County following the mandatory exit. The Deschutes County Sheriff’s Department and the Redmond PD shut down our event in its final hours with several SWAT teams present; reminiscent of Waco, Texas, and many other instances of what occurs when there are abuses of state power over the public. The ensuing mayhem, anger, & confusion caused by the unnecessary event cancelation, put more lives in danger than any “verbal tussle.” Thousands of disappointed attendees, vendors, sponsors, media partners, & event organizers are now left with a very unsettling and unsatisfying experience. We had professional security services on the grounds; they, in conjunction with local law enforcement, could have come up with a dozen different ways to handle a “perceived threat,” and allowed the event to continue to its conclusion. We ask you, the public, for some patience as we prepare to responsibly, and legally, respond to this act of tyranny, while assessing the damage it has caused everyone involved. There have been many questions of refunds; as more information becomes available, it will be posted on our website http://www.runtothecascades.com . Refunds should also be sought from those responsible for illegally shutting down the event; law enforcement, the fair board, and county commissioners. We would also like to clear up a couple points of misconception: We worked closely with fairground director Dan Despotopulos in pre planning and during our event. Dan was charged with informing us that law enforcement was making arrangements to close our event and it is our impression that he did not agree with plans pay grades above his had made. Secondly as soon as RTTC was made aware that the police were even thinking about closing the event—approximately 2 HOURS before it actually happened—we ceased charging at all gates! We are members of this community and have no interest in charging our neighbors and out-of-town guests for something the police might, and did, shut down without cause. Thank you for your patience, support, and cooperation as we move forward. UPDATE: September 17, 2012 — I was in Central Oregon this past weekend. I grabbed a coffee and happen to read a report in the TSWeekly where the Redmond police are urging fairgrounds officials to never host another biker rally. “This event is something I will strongly advocate to never be held here again,” Redmond Police Capt. Brian McNaughton told reporters. Photo courtesy of Run To The Cascades web site.